TimberLOK replaces 3/8" lag screws and enables you to complete wood-to-wood projects faster, easier and stronger. TimberLOK is approved in ACQ Pressure Treated Lumber. There is no need to predrill with TimberLOK, it’s sharp point and aggressive threads zip right in to the densest woods. A 6" TimberLOK is a code-compliant way to attach rafters or trusses to a double top plate. 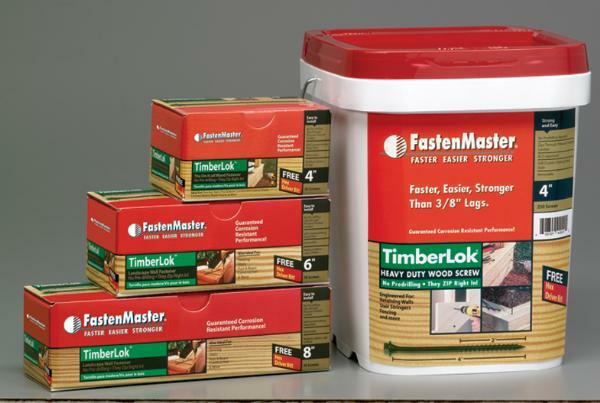 The FastenMaster TimberLok enables you to complete wood-to-wood projects faster, easier and stronger. • Stronger design shear values than 3/8" lags. • Nationally recognized testing and code approvals. • Sharp point and aggressive thread penetrate the densest woods without predrilling. • Unique tapered head countersinks easily into wood for flush appearance. • Variety of lengths, from 2-1/2" to 10", to match every application. • Proprietary three step coating process protects against corrosion, even in pressure treated wood. ACQ Approved. • Free 5/16" bit in every package.